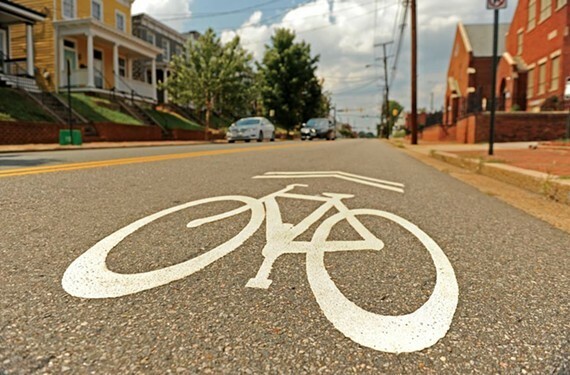 Richmond Shares Plans for Bike Lanes in 2017 | News and Features | Style Weekly - Richmond, VA local news, arts, and events. The meager bike racks outside Main Library downtown were packed Tuesday night for what was hailed as the city’s largest bike infrastructure meeting. More than 100 people come to offer feedback on 10 bicycle infrastructure projects, about 25 miles of lanes, in varying stages of development. The four-lane road, which narrows into two at Hatcher Street, would have buffered bike lanes added in some sections. In others, sharrows, the painted inticators on pavement, are proposed to maintain street parking and car travel lanes. This four-lane divided artery would add a buffered bike lane. A few options are being considered, including one with the bike lane to the far right of the road, maintaining two car lanes, and one that can double as travel or parking. Another option has a permanent parking lane to the far right, the bike lane in the middle and a single car travel lane. The four-lane, divided road would have a bike lane created out of the shoulder, which is sometimes used for illegal parking. The four-lane road with car parking on either side would be converted to two lanes for cars, with intermittent left-turn lanes. A buffered bike lane is proposed, either curbside, protected by a parking lane, or in between a parking lane and travel lane. Six other plans are in the works to alter Grayland Avenue and Government Road, Patterson Avenue from Commonwealth to Thompson, Westover Hills Boulevard from Forest Hill to the Nickel Bridge, and a South 17th Street cycle track. The city is accepting comments through mid-December on its website.